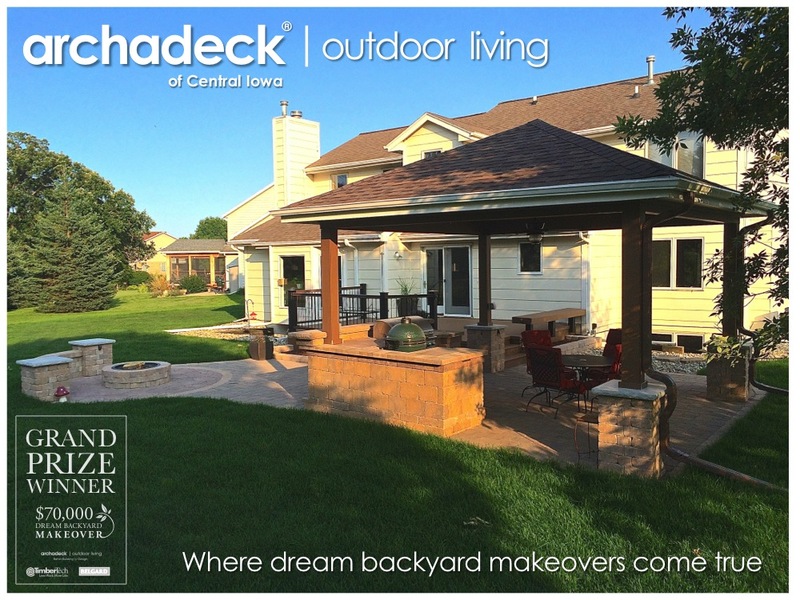 Its been quiet here in regards to Rick and Merea Bentrott’s Dream Backyard Makeover since our May completion of their deck, patio, porch and outdoor kitchen project in Huxley, IA, a few miles north of Des Moines. But, it’s time to break that silence! For those new to the Bentrott’s project proceedings, it was a $70,000 Dream Backyard Makeover Contest conducted in early-spring last year. 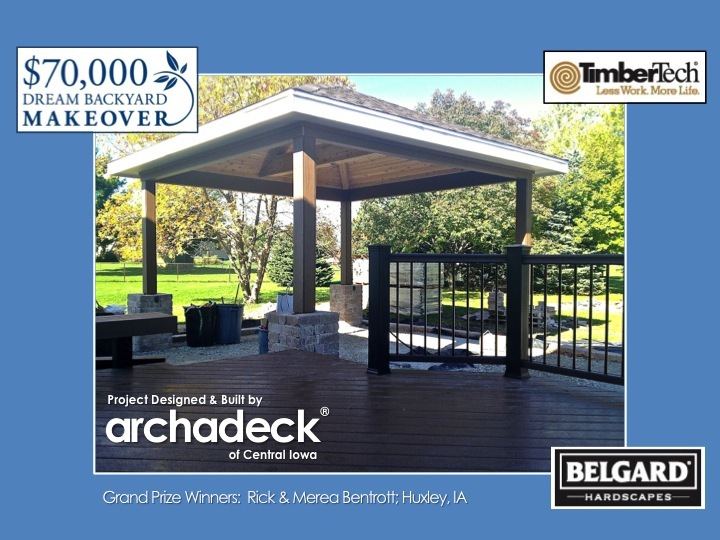 Our Archadeck franchisor, Outdoor Living Brands, Inc., and two of our preferred product suppliers, TimberTech and Belgard Hardscapes, teamed up to sponsor this first-ever contest across our national Archadeck | Outdoor Living system. 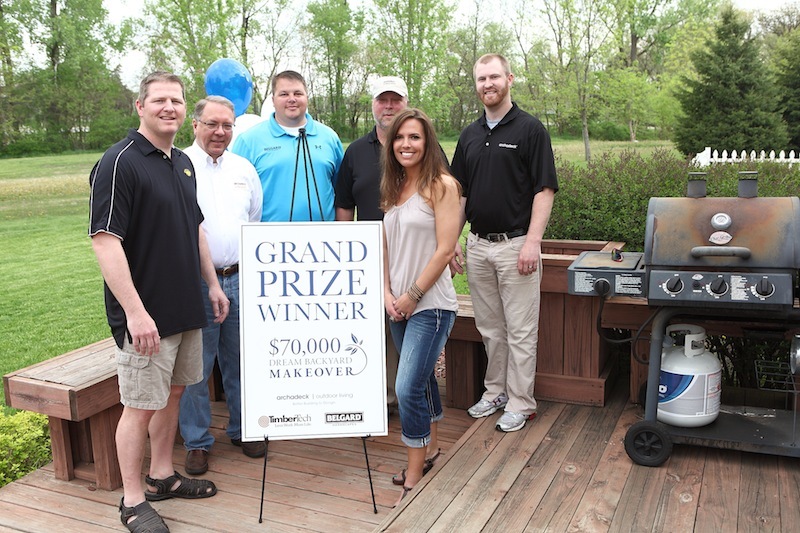 The Bentrott’s were the lucky winners of the $70,000 Dream Backyard Makeover Grand Prize! 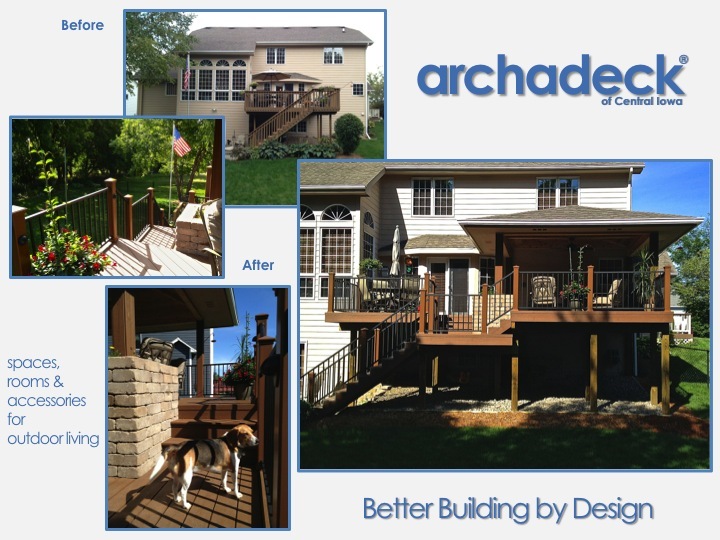 Archadeck of Central Iowa was honored to have winners from Central Iowa and to design and build the project for the Bentrott family. Unlike many contests like this, we didn’t have things like keys to a new car or a big cardboard – or real – check to hand to the winners to enjoy instantly. Instead, we offered Rick and Merea our award-winning outdoor living design/build services in exchange for their backyard. We did surprise them with a “Publishers Clearinghouse”-style announcement, though; $70,000 was certainly worthy of that. After that surprise settled in, we worked with the Bentrott’s and our project sponsors through the summer to design what that grand prize project would actually be. Through several design iterations and a construction phase that was interrupted by an early, harsh and long winter, a beautiful, multi-purpose outdoor living space emerged. 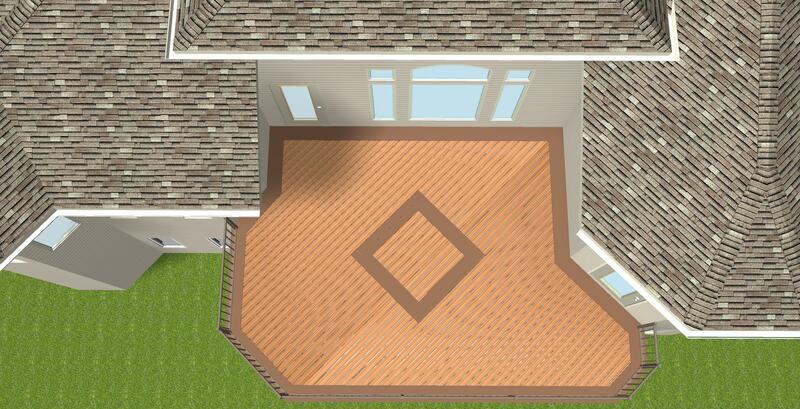 The space includes a deck that flows to a multi-purpose patio. Part of the patio is covered with a freestanding, cedar-finished, open porch, with the remainder of the patio open to the big Iowa sky. 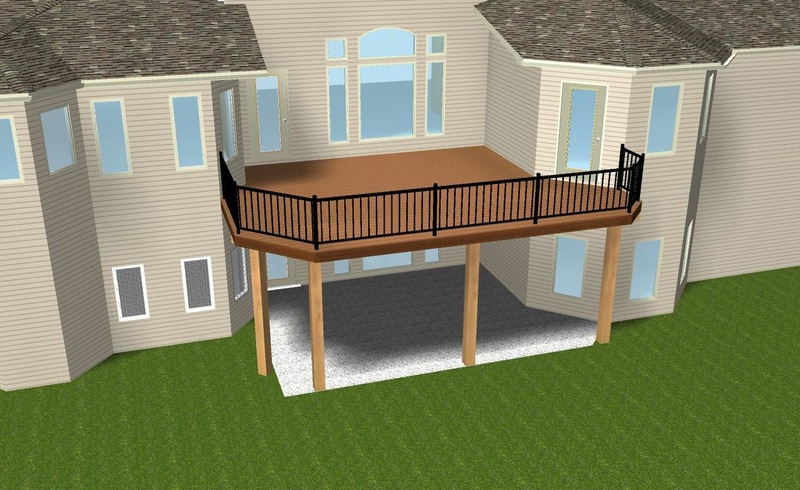 The deck features TimberTech’s capped-composite Earthwood Evolutions low-maintenance decking, with TimberTech’s Radiance railing system. The open patio area includes a firepit and seat wall. An outdoor kitchen resides underneath the porch, complete with a built-in American Outdoor Grill and a Big Green Egg smoker. Belgard Hardscape’s Elements division custom-built the kitchen and we used Belgard’s Urbana and Mega Arbel pavers and Weston Wall Stone throughout the patio space. TimberTech’s DeckLite low-voltage lighting components softly illuminate the entire space under the stars. The Bentrot’s new outdoor living space was completed last May. 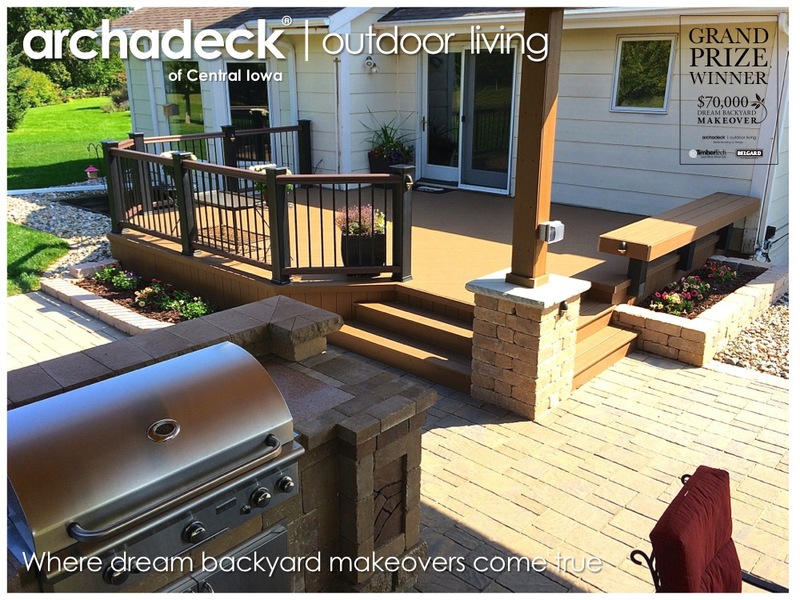 Scheduling of follow-up yard work with the busy schedules of a young-professional family – with four children – and Central Iowa’s favorite deck, porch and patio builder precluded a “grand reveal” and celebration of the makeover until early this Fall. We christened the space with the Bentrott’s and several of their friends on a beautiful, early fall evening a few weeks back. The pictures in this blog post are our first public showing of the completed project and all of its features. 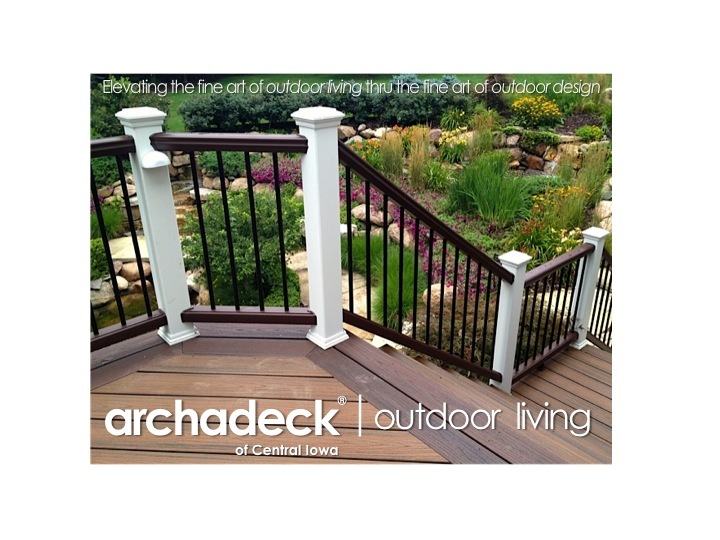 Look for the video and more pictures to be published on our central-iowa.archadeck.com web site as well as throughout our various web-based media channels (Google+, Facebook, Twitter, Houzz, Pinterest). Additionally, the project will be featured in an early-spring 2015 edition of our local Welcome Home Des Moines magazine. Open Porch over Belgard paver patio and outdoor kitchen, as viewed from the deck. Congratulations, again, to Rick and Merea Bentrott and their family. For winning the contest. For living outdoors. Memorial Day weekend. Already. And, yet, it seemed so long in coming. A tough winter here in Des Moines…Central Iowa…and many places across this great country. And a tough spring (or was it winter?) followed. Maybe moreso than any other holiday, there are many events, celebrations, milestones and memories associated with Memorial Day and the weekend(s) around it. First and foremost, the “true meaning” of Memorial Day: Originally known as Decoration Day, it was a day set aside to remember soldiers who died in the Civil War. Unfortunately, more wars followed and so have the lives of (too) many American service men and women. So, the day has evolved to remember all Americans who have sacrificed their lives in military service for the freedoms the rest of us enjoy. 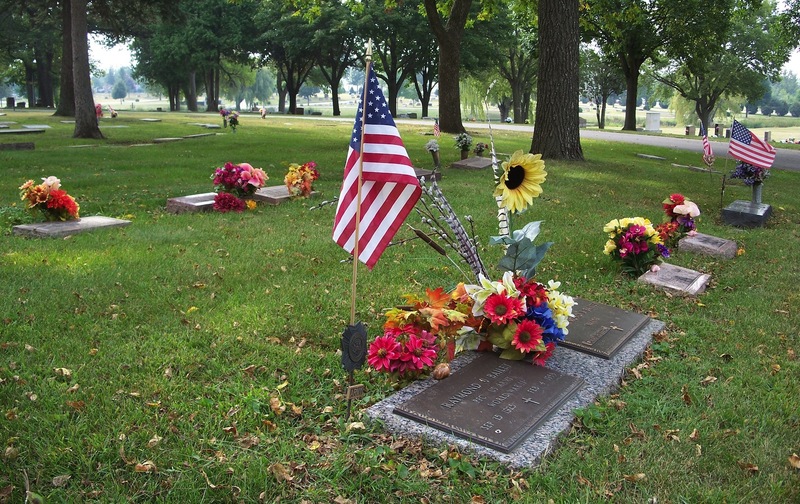 The “decoration” part comes from the tradition of decorating soldiers’ graves with flags and flowers. That aspect of the tradition has further expanded to general maintenance and decoration – and memorials – of all family members’ graves sites, regardless of their military service. Cemeteries never look better than they do on Memorial Day. Folks in the southern half of the country may not appreciate this as much as those of us in the Des Moines latitudes and above, but Memorial Day’s place on the calendar positions it at what has become the “unofficial” start of summer. Or, some might say, the “official” start of the outdoor living season…maybe the first weekend of full-blown outdoor parties or social gatherings on your deck or patio. Not to mention pool openings and pool parties. Technically, the summer solstice happens on June 21st (give or take a few hours), when the sun hits its peak. Technically, outdoor living season can be anytime…if you’re properly equipped with a 3-or-4-season room, a firepit or fireplace, a heated pool or hot tub…or skis and layers of Thinsulate. But, why wait? School’s Out For Summer! Going hand-in-hand with the start of summer, school years end around Memorial Day as well. And with that comes various graduation celebrations as our children and grandchildren pass from one education level to the next…ultimately into the “real world.” Many of these celebrations also occur outdoors on decks, porches and patios with outdoor kitchens as functional as the one next to your living room inside. But, with a better view of the big Iowa sky and landscape. around Memorial Day weekend (Sunday). 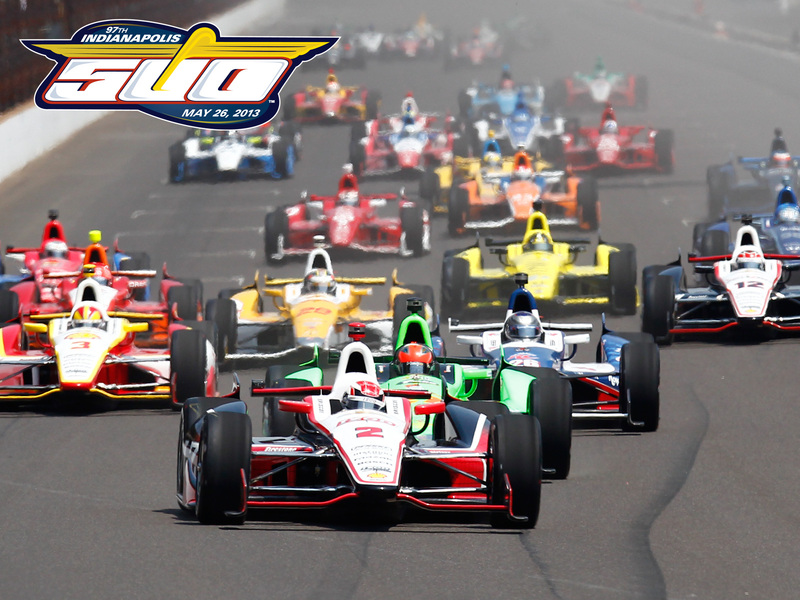 In Indianapolis, Indiana, its Indy Car’s crown jewel…maybe racing’s overall crown jewel…the Indianapolis 500. Later in the day, Charlotte, North Carolina (home of our largest Archadeck office), hosts NASCAR’s Coca Cola 600, its longest distance race. Good luck to Kurt Bush, who will try to become only the fourth driver in history to complete both races on the same day. 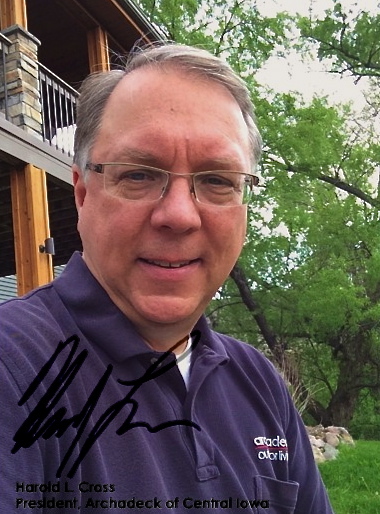 Maybe you will catch many of his anticipated 2,400 left turns on the outdoor TV’s that are getting installed more frequently on the patios, porches and decks we’re designing and building here in the Des Moines area. While all these activities may seem a bit disparate, a common theme here is all the opportunities that Memorial Day gives us to (finally – after a long winter) get outdoors…to live outdoors…to celebrate outdoors, eat and drink outdoors. 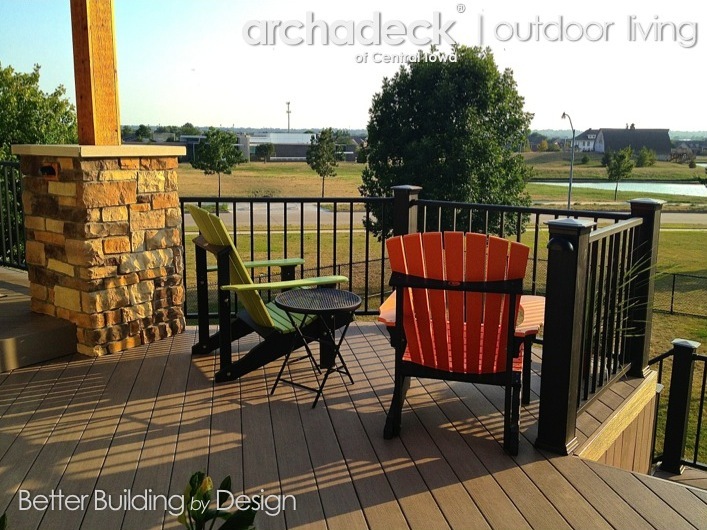 Archadeck of Central Iowa designs and builds spaces for these purposes year-round. Not just for uses around Memorial Day, but for year-round use (seasonally, depending on the space). This year, though, we had an exceptional number of projects that were started last fall and over the winter (a very tough winter for the building side of our business) that were specifically targeted for many of these activities associated with Memorial Day. 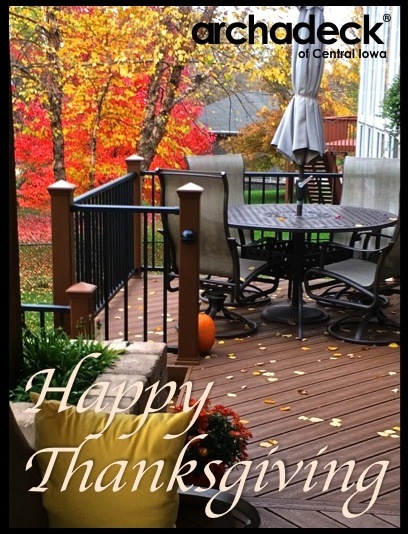 A Clive family engaged us last fall for a new Trex Transcends deck with Westbury aluminum railing, to be completed in time for their Memorial Day weekend graduation party; started in early November, we completed it a couple of weeks ago. We actually had breathing room on this one. 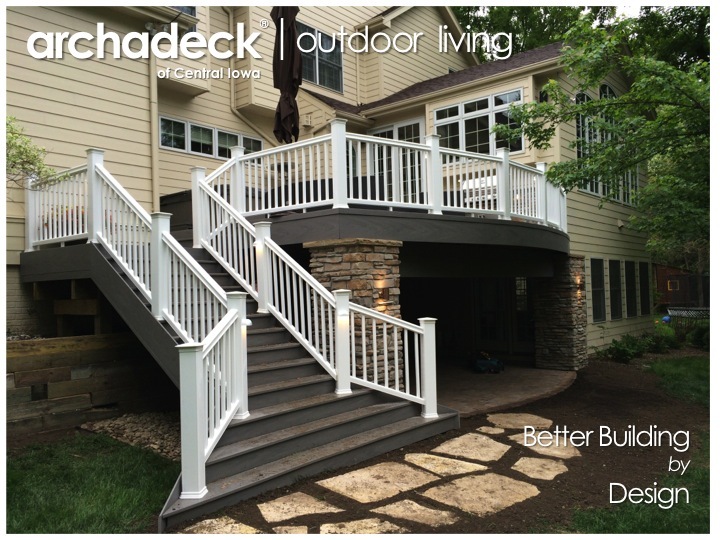 A Waukee family considered several design options for the new TimberTech/Azek XLM deck space they wanted for their graduation party, ultimately settling on a curved deck with a hot tub and an outdoor kitchen. Stone columns were incorporated into the design to enhance the aesthetics of this space. This design effort was completed in December. But a surprise need for a variance with the City (resulting from a prior contractor’s oversight) delayed our construction start until mid-January; the cold and deep frost then slowed our efforts dramatically. But, we had the project ready for their party held on May 3rd. 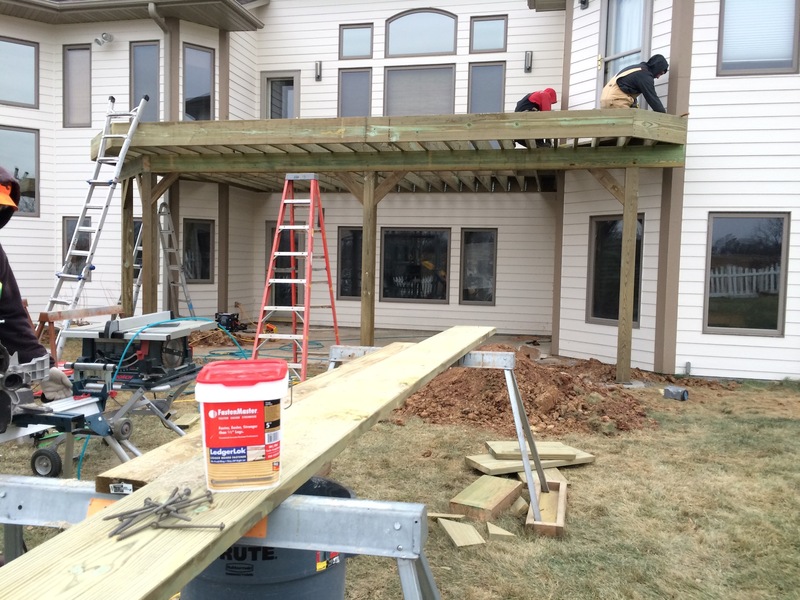 We built a new Trex Transcends deck – structured with Trex’s Elevations steel framing system – for an Ankeny couple last fall. The deck leads to their in-ground pool and includes built-in seating and wide stairs book-ended by stone columns…which didn’t get fully installed before it got too cold last fall. That stone went on this week – the same day they opened their pool. Their deck will make a big first splash this Memorial Day weekend. A Des Moines family (and a neighbor of mine) engaged us last December for a new open porch over a TimberTech Earthwoods Evolutions deck with Westbury aluminum railing. 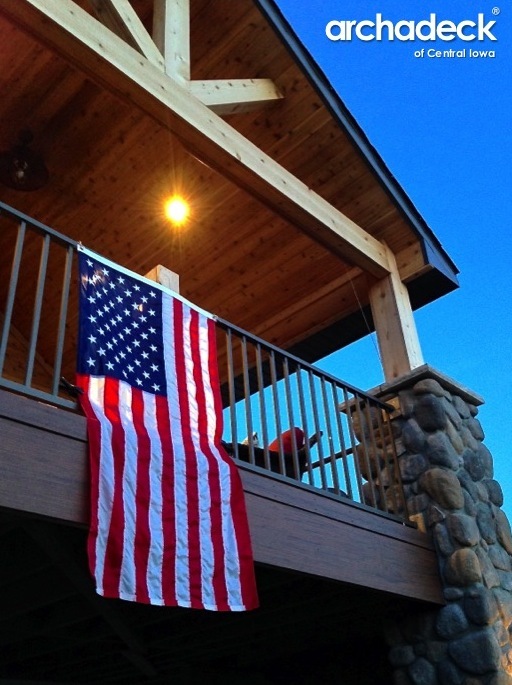 Their son serves in the military, stationed in Alaska, and was scheduled for a Memorial Day weekend leave to visit his family at home…and celebrate with them on their new porch and deck. Stone column work was completed this week and the project was ready for this soldier’s return. I think I hear them celebrating now! 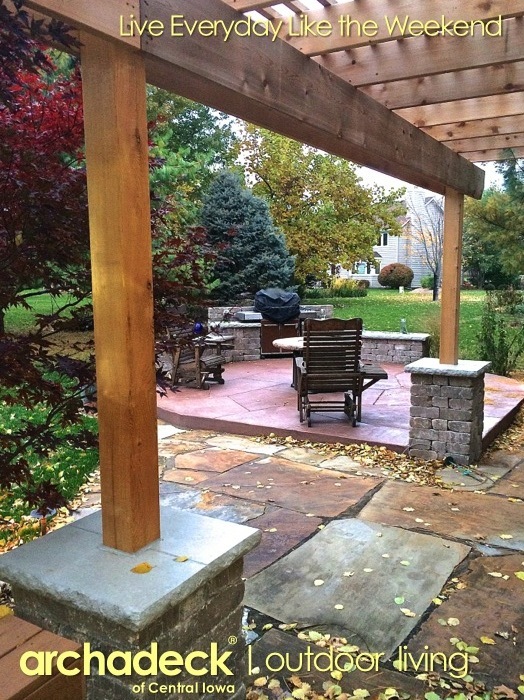 To be sure, Mother Nature’s harsh winter complicated our efforts to get these four Des Moines-area outdoor living projects completed in time for their various Memorial Day timeframe deadlines. But, we did complete them….by the skin of our teeth. Additionally, our delays in getting the Dream Backyard Makeover Contest-wining project in Huxley completed last fall was also a factor of the early, hard and long winter we had. That project was also completed earlier this month and the Bentrott’s have been enjoying the space the past couple of weekends. But we’re waiting for the “grand reveal” of that project until the official “launch” party, currently targeted for mid-July (stay tuned). On the flip side, two springs ago (2012) we were laying Belgard paver patios in March in 80-degrees in shorts and t-shirts. Weather – particularly in spring – and its impact on our outdoor living space building capabilities, is a roll-of-the-dice anymore. All the more reason that if you want a new Central Iowa outdoor living space to enjoy early next year, you should be contacting us sooner than later. All the more reason to celebrate Memorial Day and all it has come to represent. All the more reason to…Go Outside and Play! Happy St. Patrick’s Day Weekend! With the green beer and all the Irish festivities falling on a Monday, it can only mean its going to be a party all weekend long. 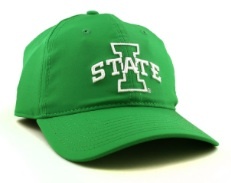 Unfortunately, our weekend weather isn’t all that conducive to celebrating the luck of the Irish (and the Iowa State Cyclones – Big 12 Tournament Champs!) outdoors on your decks, patios and porches around Des Moines. A cold nip in that wind today. Rain and snow tomorrow. No problem for those of you with fireplaces in your Central Iowa porches. But even for the rest of you, with the winter we’re coming off of, I’m sure it will hardly stall the flow of green beer wherever you celebrate. Have fun. Be safe. Then call us about that fireplace in your porch for next year! St. Patrick’s Day also means that parties of all kinds will soon be moving outdoors (really, spring and summer are coming). With that, folks will start considering improvements to their outdoor spaces in earnest. Four years ago, I kicked that theme off here with a post about decking and railing color combinations and tied that to St. Patrick’s Day because of the green colors associated with all things Irish…shamrocks, leprechauns, four-leaf clovers and, of course, beer. That post and a couple of follow-ups are linked below. I really try not to recycle content here. But in this case, you don’t seem to mind – its one of the most-read topics here…probably as much because of the reference to green beer as to Trex’s Spiced Rum decking color. But, we like both, right? For 2014, the updates are focused on the product consolidation and integration activities associated with Azek’s holding company purchase of TimberTech a couple of years ago. As part of that effort, TimberTech’s PVC-based decking products have been re-branded as Azek XLM such that all PVC-based decking under the CPG umbrella is now branded as Azek. With this, there are now 17 different styles/colors of Azek PVC-based decking boards now available. TimberTech’s wood-plastic composite (Twin Finish (3 colors), ReliaBoard (2 colors)) and PVC capped-composite (Earthwood Eviolutions) products have remained as TimberTech-branded boards. The Earthwood Evolutions product has been expanded to include a Legacy line of boards designed around a hand-scraped hardwood look; these new boards are stunning both in coloring and look. We’ve had these new boards laid in our Urbandale showroom for just a couple of weeks now, but they are quickly gaining rave reviews. 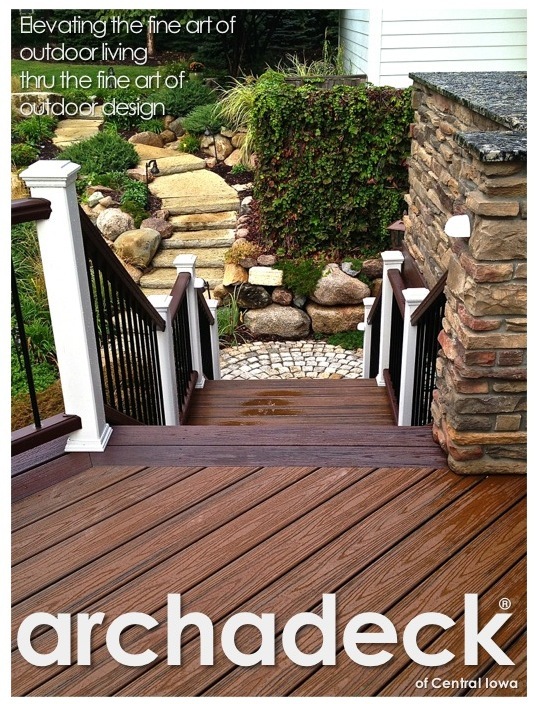 Overall there are 12 different styles/colors of TimberTech’s Eathwood Evolutions line of PVC capped-composite decking. If you’re trying to keep score at home…the Azek/TimberTech score for 2014 is: 34 different styles and colors of deck boards. In addition, TimberTech offers 4 different rail styles in a 9-color spectrum, while Azek offers 3 styles across a similar color palette. 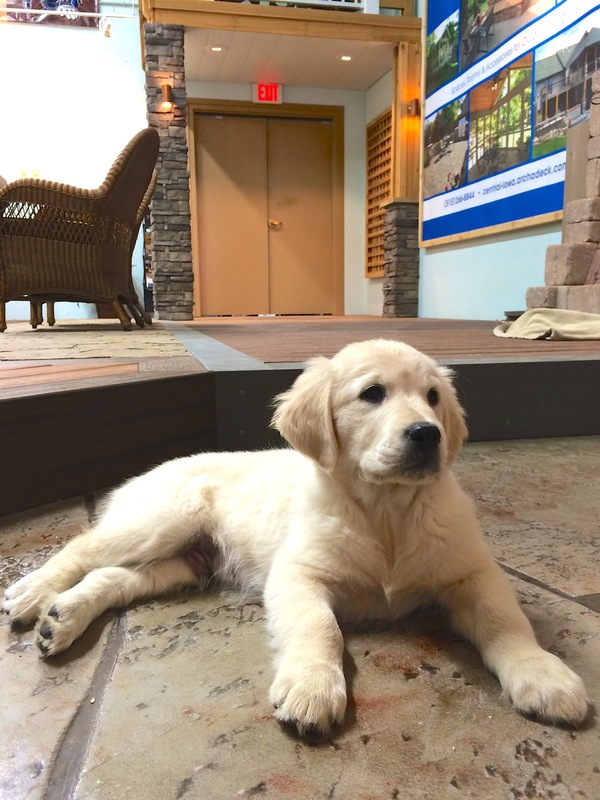 Now…are you ready for Trex Transcends and Belgard pavers and wall stones…and colored and stamped concrete colors? The good news (from a simplicity perspective) is that new product and coloring offerings here are minimal – if any – compared to last year. So, I will refer you back to last year’s posting, particularly for the Belgard and concrete information. Last year, though, Trex started offering their Trex Pergola product in all the sold colors of Trex decking. With that, low-maintenance pergolas no longer are confined to white or beige color options. We’ve yet to do a colored Trex Pergola in the Des Moines area, but my counterpart at our Archadeck of Ft Wayne office did a very nice project that exemplifies the new aesthetics offered with the Trex Pergola product. From other Trex perspectives, we really like – and therefore, focus on – Trex’s Transcends line of PVC capped-composite decking and railing products. So much so that we became Central Iowa’s first TrexPro installer last year. 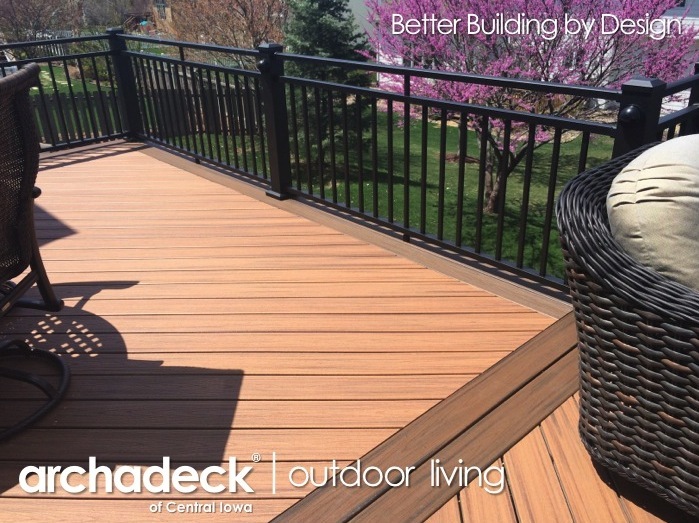 Trex has maintained their Transcends product and color offerings from 2013 into 2014 – 8 colors of deck boards, 7 colors of railing (and Spiced Rum is still my favorite name and color). 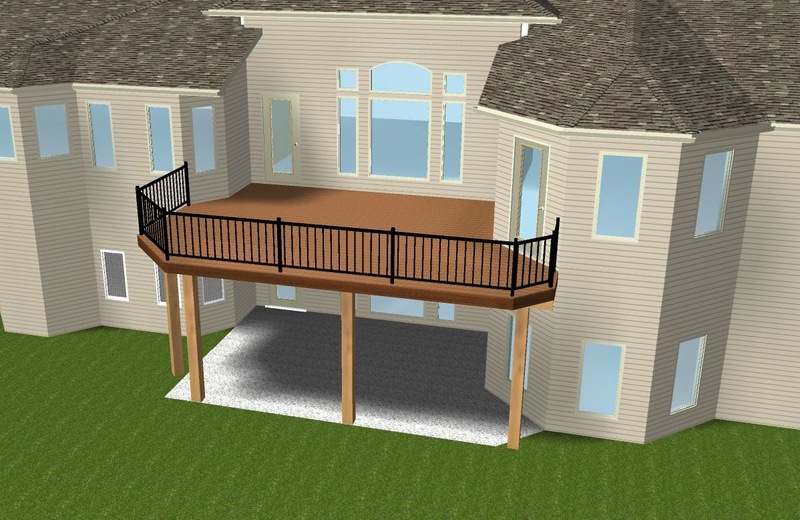 What excites us about Trex is their innovation around the decking and railing spectrum. Their Elevations steel framing system is the future of deck framing and ultimate structural performance…if you consider the future now; we did two deck projects here in the Des Moines area last year using Trex’s Elevations steel framing system. Additionally, Trex’s new offerings of spiral staircases, Trex furniture, Trex deck and landscape lighting and aluminum railing solidify their commitment to offering the best in outdoor living products. 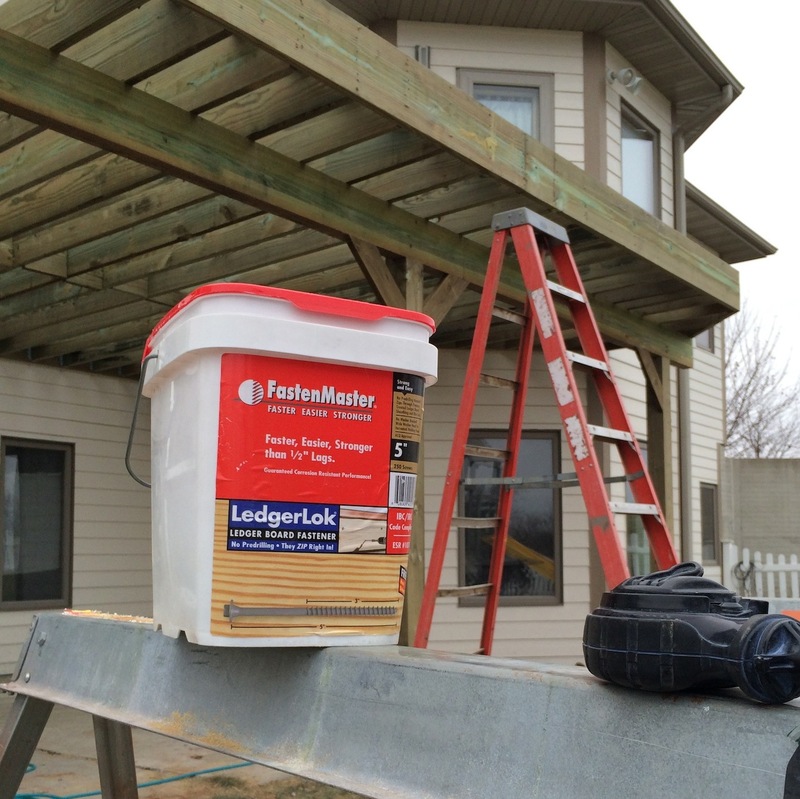 We are proud to be associated with their products and innovations thru our TrexPro relationship and we’re excited to bring more of those into Des Moines and Central Iowa backyards. We’ll feature more of our Des Moines-area Trex projects and our TrexPro relationship in future posts here. Colors galore. Options galore. It really does take more than the luck of the Irish to put these together nicely in an outdoor living space design. 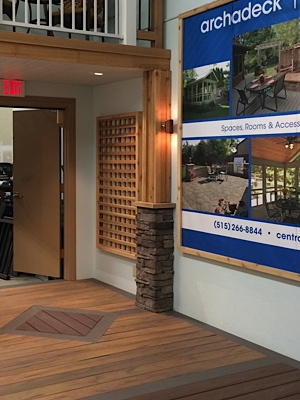 With preferred supplier relationships with TimberTech/Azek and Belgard and now our TrexPro relationship with Trex, Archadeck of Central Iowa is uniquely positioned to design and build your outdoor dream spaces. All backed by the strongest warranty and guarantee programs through a proven 34-year franchise system. When it makes sense for you to pursue your outdoor dreams, contact us for a complimentary design consultation. Better Building by Design. The Archadeck Difference. What do Peyton Manning and Punxsutawney Phil have in common? On Super Bowl Sunday, they were both frightened by their shadows and retreated to their respective burrows to hunker down for another 6 weeks of winter. OK…so that was a bit harsh on Mr. Manning. On the other hand, its been a harsh winter. But not just here in Des Moines; winter has been a nationwide epidemic this year. That is, if you consider 2” of snow an epidemic…Atlanta. Geesh. But, Atlanta, we’ll give you the benefit of the doubt…we northerners don’t expect you to be prepared. While lack of preparation likely wasn’t Peyton Manning’s downfall, team execution was. Get Inspired. Get Started. And..Get Outdoors! 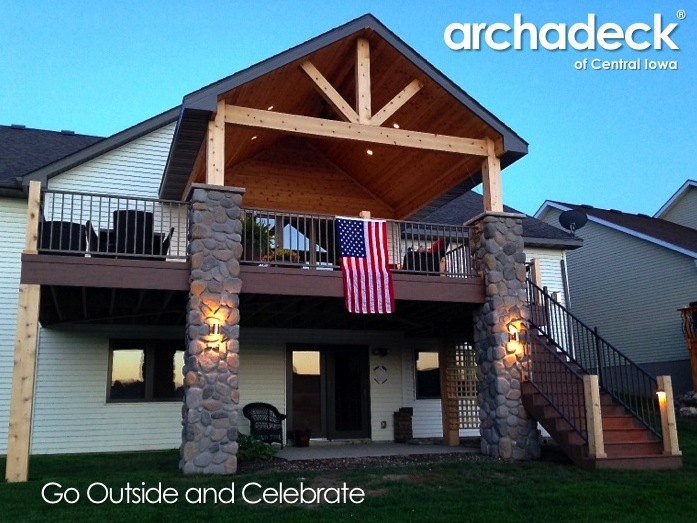 Archadeck of Central Iowa is Des Moines’ premier custom designer and builder of decks, porches, patios, pergolas and related accessories such as outdoor kitchens, firepits, conrnhole (bags) boards…to name but a few. 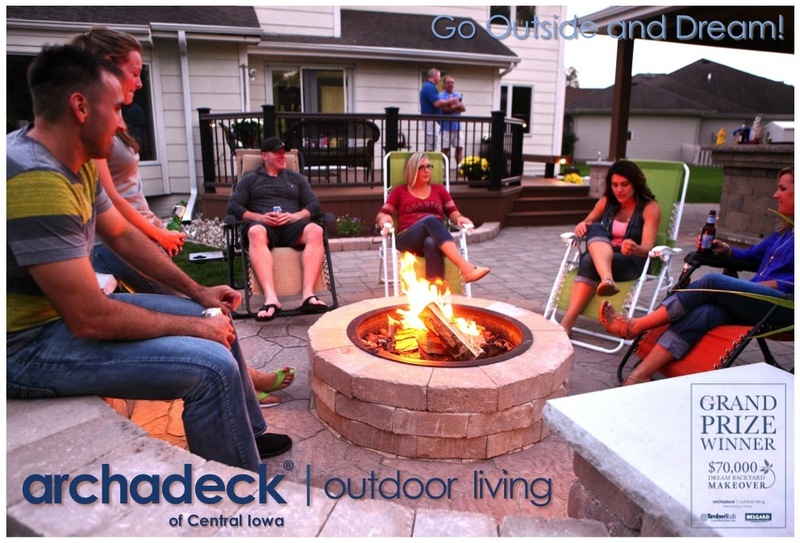 Our outdoor living spaces, rooms and accessories have inspired Des Moines area folks to get outdoors – living outdoors – for nearly 17 years. 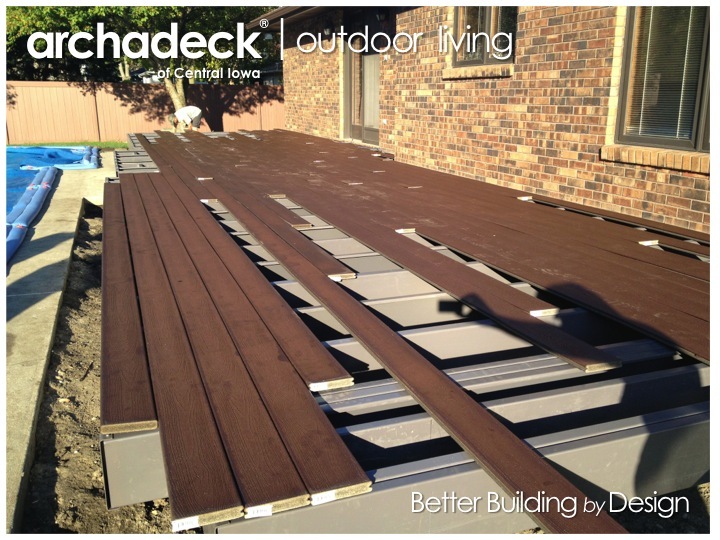 Archadeck of Central Iowa will be displaying at the 2014 Des Moines Home+Garden Show…17 years running now. This year, we are going back to our roots – you’ll find us in booth 2218 in the lower-level of Vets Auditorium, near the Butterfly Garden. Yes, I said “Butterfly Garden;” check it out. 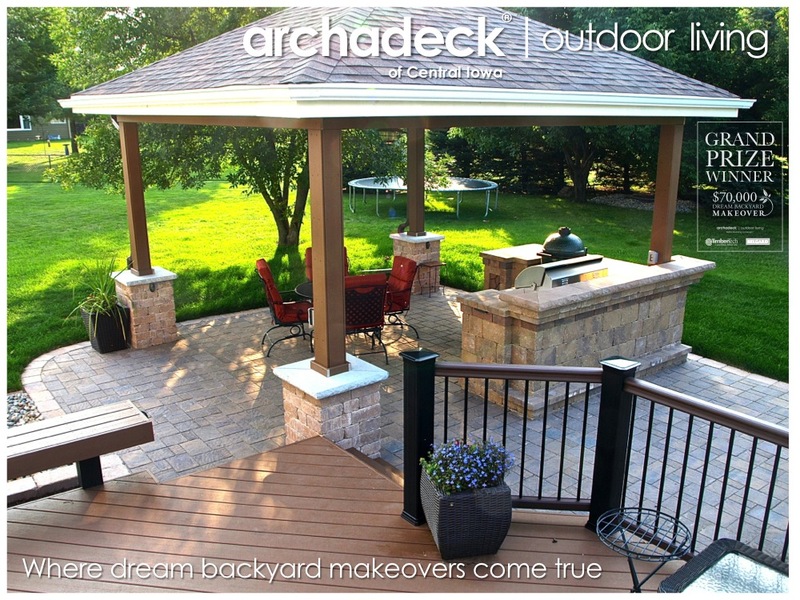 Then come see our Trex Transcends deck, Belgard pavers and walls, wine bottle-adorned cedar privacy fence and talk to us about outdoor living trends, products and Archadeck’s design/build services. The inspiration for many home improvement, gardening and landscaping projects gets started at this show every year. Our focus is certainly the “outdoor” structures and spaces aspect of your home…and the accessories that go in and around them. We apply that focus first in preparation (unlike Atlanta)… the planning, design and product expertise that make a project work for your home and your family. 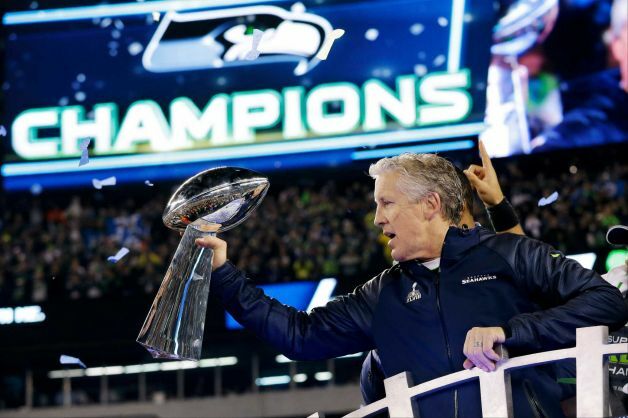 Secondly, we apply our focus on execution (unlike the Denver Broncos)… getting it built as planned/designed, warranting our work and guaranteeing our performance. No better place to get started with your inspiration for outdoor living spaces than with us at the 2014 Des Moines Home+Garden Show. Actually, there is a better place, but lets don’t tell the Home+Garden folks that. For instance, your Des Moines area backyard is a pretty good place to get inspired and started…when its warmer. The Des Moines Home+Garden Show only runs 4 days. 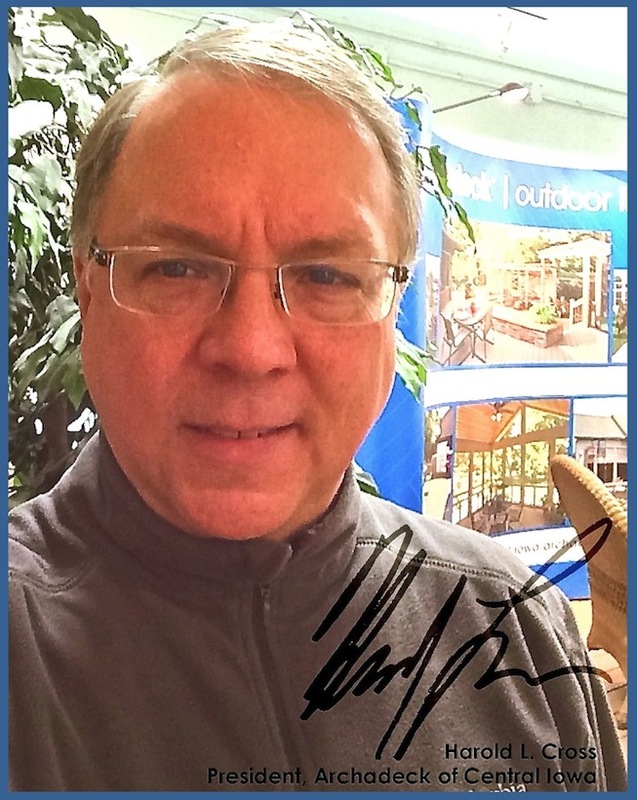 But, we do outdoor living year round and our office/showroom in Urbandale facilitates our mission year round. In fact, we’re currently renovating our office/showroom to facilitate that mission even better (stay tuned for details). So, ultimately we’ll meet in your backyard and at our office/showroom. But, this weekend, the best place really is the 2014 Des Moines Home+Garden Show. We hope to see you there. Hopefully, you had a wonderful Thanksgiving celebration with your family and friends and your travels were safe if you were on the road over the Thanksgiving weekend. Like much of the country, we had an early blast of winter here in Central Iowa. Unlike much of the country, that weather was through here before Thanksgiving itself so our local travelling and holiday gatherings were only minimally impacted by Mother Nature. However, the same can not be said of Mother Nature’s impact on our continued progress on the Dream Backyard Makeover Contest project. While our first blast of winter came before Thanksgiving, it also came right on the heels of the delivery of the Bentrott’s custom-built outdoor kitchen. 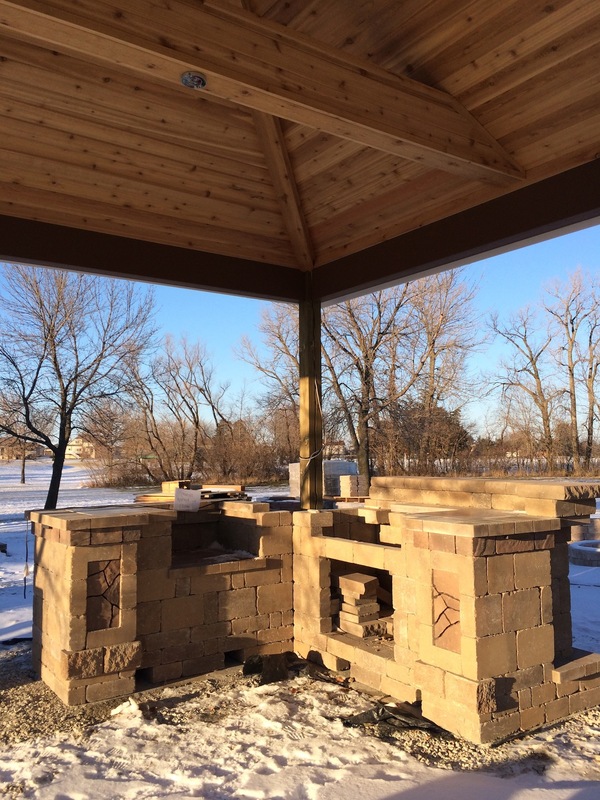 As detailed in our last posting here, Belgard’s and Harmony’s build schedule for the outdoor kitchen put us in a race with an impending Iowa winter. We were begging for leniency from Mother Nature, but last week – as the following video recounts – winter won that race. With good weather conditions, our crew believes they could have the project wrapped up with about a week of effort. Unfortunately, we didn’t get that week between Belgard’s delivery of the outdoor kitchen and Mother Nature’s delivery of winter. Most of the work left involves hardscaping…putting the finishing touches on the outdoor kitchen and laying the remainder of the Belgard Urbana patio surface. So, we’re going to need a thaw and a week of consistently warmer weather (above freezing at night, 50’s or better during the day would be nice) before we can undertake that remaining work. We’ll be ready as soon as Mother Nature is.